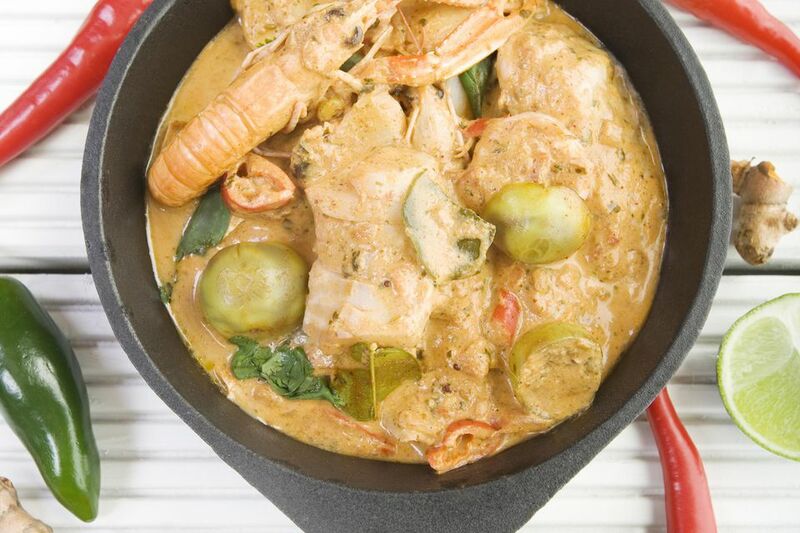 Masala fish curry can be prepared with a variety of different fish and seafood, such as mackerel, king mackerel, whitebait, lobster, mussels, oysters, clams, or dry shrimp. It tastes great with a side of pilaf or simple, plain boiled rice and a green salad. In a large, non-metallic bowl, mix the ginger paste, garlic paste, lime/ lemon juice, and salt to taste. Stir to mix well and make a marinade, then add the fish pieces. Mix to coat the pieces well with the marinade. Keep aside. Now heat a large pan on medium. Add the cooking oil to it when hot. When the oil is hot, add the green chilies, cinnamon, and cloves. When they stop spluttering and turn slightly darker and aromatic, add the cardamom powder, cumin powder, and coriander powder. Mix well and sauté for 1 minute. Now add the sliced onions and sauté until soft and translucent. Now add the potatoes, jaggery/ palm sugar, salt to taste and approximately 1 cupful of hot water. Bring to a boil, simmer heat and cook until the potatoes are tender. Now add the tomato and the previously marinated fish gently to the sauce. Use a spoon to cover the fish completely with the sauce/gravy — cover and cook for 5 minutes. The gravy should be relatively thick and the fish tender. Add the mace powder and toddy/ vodka and stir gently. Turn off heat immediately and cover the pot. Leave for 5 minutes. If desired, garnish with chopped coriander and serve on a bed of Pilaf or plain boiled rice. Add a green salad for a well-rounded meal.